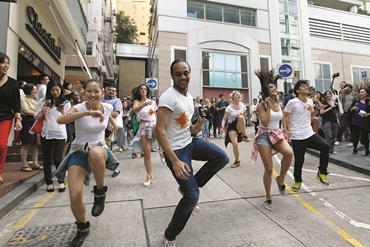 SCMP Group Ltd (SEHK: 583), Asia’s leading media holding company, today announces that its Marketing Solutions division will once again blanket the Starstreet Precinct with revelry as the annual feast of culinary delights and street performances – “Starstreet Gourmet & Wine Walk” – returns. Organised by Starstreet Precinct and powered by SCMP Marketing Solutions for the fifth consecutive year, Starstreet Gourmet & Wine Walk has become a highly-anticipated fixture in Hong Kong’s culinary calendar. This year’s Starstreet Gourmet & Wine Walk has lined up 38 food and beverage establishments and fashion accessories boutiques, and will turn Starstreet Precinct into the definitive gastronomic and fashion lifestyle destination from 2:00pm – 6:00pm on Saturday, 25 October 2014. Starstreet Gourmet & Wine Walk, sponsored by Swire Properties Limited, will transform Starstreet Precinct, an affectionately named neighbourhood adjacent to Three Pacific Place in Wan Chai, from a collection of eateries and boutiques into a communal soiree. Starting from HK$300 per person*, guests will be pampered with gourmet dishes, fine wine, live music, unique street art, carnival-style games, bicycle performances and a photo contest. Selected lifestyle outlets around the Starstreet Precinct will also delight ticket-holders with discounts and limited-edition gifts. All guests will have the chance to walk away with a host of fabulous prizes, sponsored by Swire Travel and East, Hong Kong, including travel vouchers, buffet dinners and many more. Part of the proceeds will be donated to the Arts with the Disabled Association Hong Kong for the benefits of artists with disabilities. Tickets usually sell out quickly. For ticketing details, please go to http://events.scmp.com/starstreet starting from Monday, 8 September 2014. * Early bird promotion (by Tuesday, 30 September 2014) @HK$300; regular price @HK$395; Group of four or above@HK$330.